A collaboration by Fame Theory. While looking through the data collected for famegame.com, we began to realize that some big name artists were turning up in the socialite database. Cross-referencing the artists showing at Art Basel Miami with the socialite database yielded 150 artist matches. 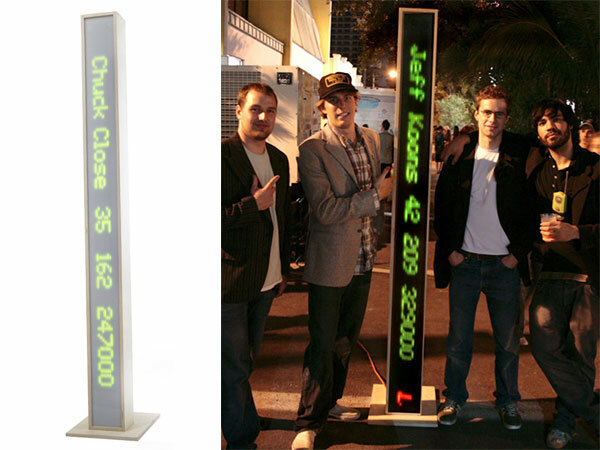 Using the data already accrued on these artists, a LED ticker was created which, in real time, shows the number of parties attended, the number of pictures taken, and the “fame” of an artist as based on the number of Google hits on top art publications. This piece raises questions about how much an artist’s work is connected to their social value within the art world. Because my social value in the art world is very small, it was virtually impossible to get the piece shown at Art Basel using social connections. Instead, we snuck the piece into elite events and showed it in various public locations during the weekend.